OTTAWA — Last year there was clutch in the Capital; this year there was a juggling 19-yard touchdown catch by Ernest Jackson in overtime of the Grey Cup. Jackson’s highlight-reel grab in the first possession of overtime ended up being the difference, as the City of Ottawa has its first professional football championship in 40 years thanks to a 39-33 win by the Ottawa REDBLACKS over the Calgary Stampeders in the 104th Grey Cup presented by Shaw. Henry Burris combined with Jackson to help the REDBLACKS fend off a furious Calgary comeback from 20 points down, capping off the biggest upset in Canadian Football League Grey Cup history. Burris was named Grey Cup Most Valuable Player for his efforts while Brad Sinopoli earned Most Valuable Canadian. 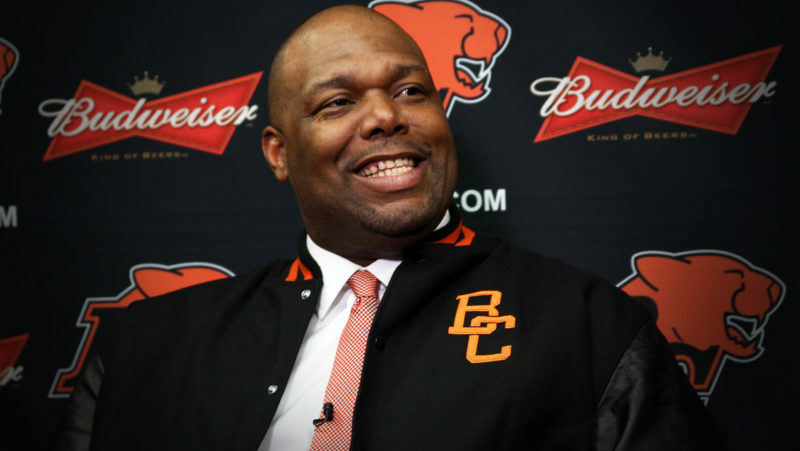 The 41-year-old Burris overcame a pre-game injury scare and threw three touchdown passes while running for two more, becoming the oldest quarterback ever to win a Grey Cup. The 17-year veteran threw for 461 yards, the fourth-most ever in a Grey Cup game, earning his second title as a starting CFL quarterback and his first since 2008. The Stampeders rallied from 20 points down and kicked the game-tying field goal with 10 seconds left to force overtime, the first Grey Cup game to go past regulation since the Edmonton Eskimos and Montreal Alouettes did it in 2005. But in the end, Bo Levi Mitchell’s third-down pass in overtime fell incomplete, sealing an Ottawa REDBLACKS victory. Patrick Lavoie and Sinopoli caught touchdown passes for the REDBLACKS while defensive back Forrest Hightower intercepted two passes in the winning effort. Burris was questionable to play after reportedly suffering a knee injury in the warm-up but in the end became the first quarterback since Danny McManus in 1996 to break 400 passing yards in a Grey Cup. 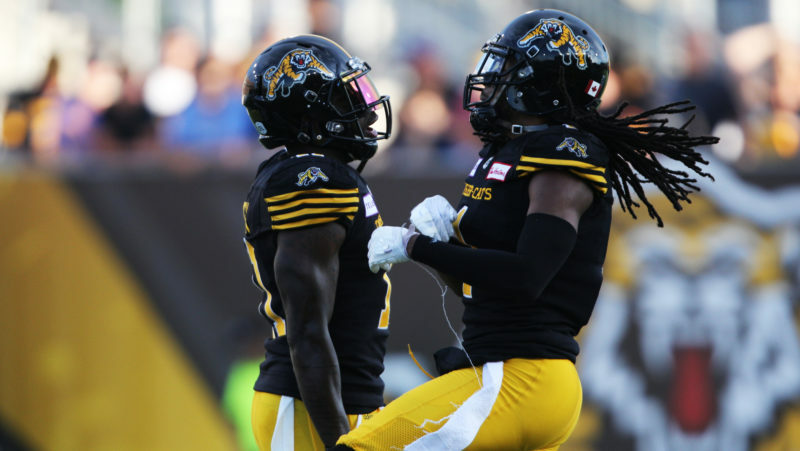 Mitchell threw three interceptions while veteran receiver Marquay McDaniel left the game with a shoulder injury and did not return after a 51-yard catch in the first quarter. The last time an Ottawa franchise won a Grey Cup was in 1976, when the Ottawa Rough Riders defeated the Saskatchewan Roughriders at Toronto’s CNE Stadium. 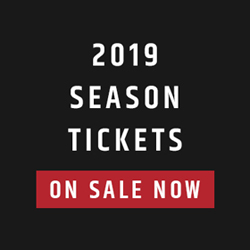 But on Sunday night, on the exact same site, a capacity crowd of 33,421 watched at BMO Field as the 8-9-1 REDBLACKS upset the heavily-favoured 15-2-1 Stampeders. 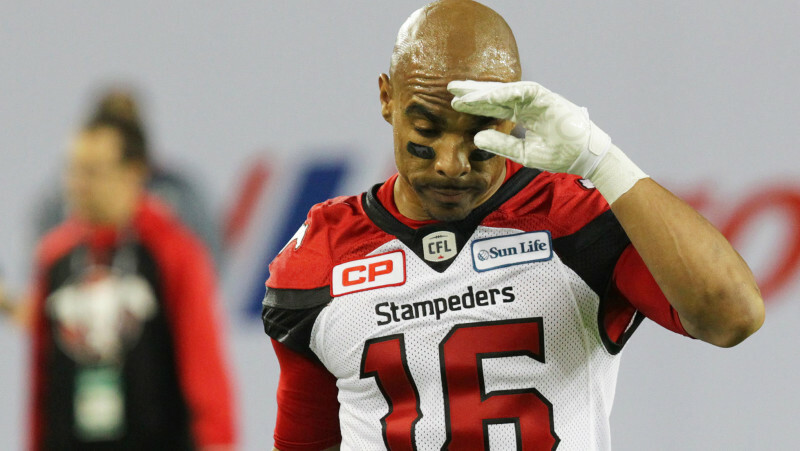 With Burris playing potentially the final game of his career, the intrigue surrounding the CFL’s third all-time leading passer reached new heights when he was seen limping off the field following warm-ups. Initial reports indicated the REDBLACKS’ starting pivot had injured his knee and was questionable to play. 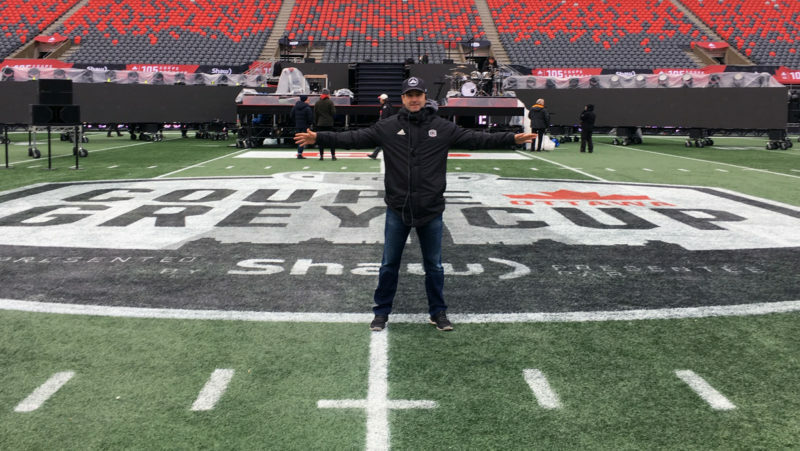 But after Trevor Harris came out of the tunnel for player intros and then stood in on the coin flip, Burris was the one under centre when Ottawa’s offence first took the field in the opening quarter. Minutes later, Burris was the one capping off a 10-play scoring drive with a one-yard touchdown on the quarterback sneak. The REDBLACKS had the Grey Cup’s first points but the hard-throwing Mitchell was quick to respond. The Katy, Texas native, fresh off the first MOP honour of his career on Thursday night, connected with a wide open McDaniel over the middle for a 51-yard pickup into Ottawa territory. Calgary’s second possession of the game ended with a seven-yard hookup between Mitchell and this year’s Most Outstanding Canadian Jerome Messam, knotting the score at a touchdown apiece. Ottawa rounded out the first-quarter scoring with a 37-yard field goal off the foot of Ray Early. Down three points, the Stampeders appeared to be picking up momentum after sacking Burris for a six-yard loss and forcing Ottawa’s first punt of the game. But on the ensuing punt, Roy Finch fumbled the return and Serderius Bryant recovered for the REDBLACKS, flipping both possession and field position. Burris and the REDBLACKS wasted no time finding the end zone after that as Lavoie caught all three of his quarterback’s completions on the drive, including a six-yard touchdown off of play action to extend the lead to 17-7. After ending the second quarter on Early’s second field goal of the game, a chip shot from 29 yards out, the REDBLACKS tilted the field further in their favour in the third. Burris had just overshot an open Khalil Paden on an attempted flea-flicker on first down, but he wouldn’t miss again, completing passes to Sinopoli and Jackson before going back to Sinopoli for a nine-yard touchdown. At that point, Ottawa had a commanding 27-7 lead — but sleeping on the league-leading Stamps would no doubt be a mistake. It was that third-quarter touchdown that seemed to kick Calgary into gear, starting with a Peredes field goal and followed by a 33-yard touchdown pass from Mitchell to Lemar Durant. The play was reviewed and upheld as the REDBLACKS failed to make contact with Durant while he was down, all of a sudden cutting the Stamps’ deficit to 27-17. Down 10 with the fourth quarter just under way, Calgary’s quarterback continued to heat up along with the rest of the Stamps’ offence. And just when it seemed like the drive had stalled, the Stampeders challenged for pass interference against Jonathan Rose at the goal line and won, leading to a one-yard plunge across the goal line by Andrew Buckley. Buckley’s touchdown capped off an eight-play, 66-yard scoring drive and also marked the first touchdown in a Grey Cup by a Canadian Quarterback since 1968, making it a 27-23 ball game with 13:24 remaining. The teams exchanged punts and just when the REDBLACKS needed a response, Burris and company came through. A 22-yard catch and run by Juron Criner moved the sticks on second-and-long, then on second-and-five Burris went for the deep ball and it was Criner again making a highlight-reel grab — this one over the head of Matt Bucknor. That led to Burris’ second rushing touchdown of the game, again from a yard out, capping off a six-play, 70-yard drive to put Ottawa back in the driver’s seat. Calgary threatened late to pull within a score as Messam’s first-down run set up a 35-yard highlight-reel grab by the rookie Daniels down to the Ottawa 27. The drive ended with a 19-yard rushing touchdown by Daniels, pulling the Stamps within a field goal with under 2:00 remaining. The Stamps quickly got the ball back when Rob Maver’s onside kick was recovered by Love, while Mitchell and Daniels continued to move the Red and White down the field. With the clock ticking under a minute left, an illegal contact penalty against Abdul Kanneh kept Calgary moving with a first down inside the 10. Not long later, however, it was Kanneh saving the game for Ottawa with a shoe-string tackle on Andrew Buckley. Paredes’ chip shot on third down sent the game to overtime, while from there Burris and Jackson took care of the rest. Mitchell finished with 391 passing yards on 28-of-38 passing with two touchdowns but also threw three interceptions. Messam, meanwhile, was held to 35 rushing yards on eight carries, but did add 59 receiving yards and a touchdown through the air. Sinopoli had six catches for 94 yards and a touchdown while Jackson chipped in with six receptions for 96 yards. The win for Ottawa ends a remarkable turnaround in the nation’s capital, where the expansion REDBLACKS went from a 2-16 season in 2014 to appearing in back-to-back Grey Cups and, now, winning one. Questions, meanwhile, will surround Ottawa’s star quarterback in Burris, who’s been non-committal on his future beyond 2016.